November 20, 2015 – A study published yesterday in Astrophysical Journal by University of Texas at Austin assistant professor Steven Finkelstein and colleagues reveals that galaxies were more efficient at making stars when the universe was younger. The announcement explains the team’s discovery, announced in the journal’s September 1 issue, that there are a lot more bright, highly star-forming galaxies in the early universe than scientists previously thought. 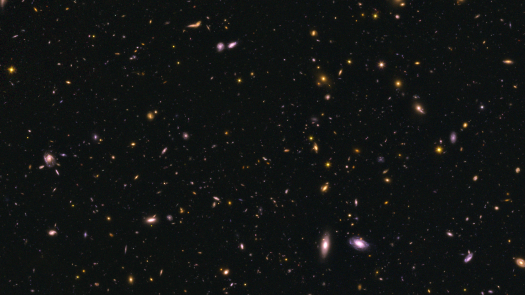 The finding stems from studies of about 8,000 CANDELS galaxies seen at times ranging from 0.75 to 1.5 billion years after the Big Bang (that is, between redshift four and redshift seven). As the universe is a little less than 14 billion years old, this corresponds to only the first five to 10 percent of the history of the universe. There could be a couple of different explanations, Finkelstein said. This animation shows the gas density in a simulated galaxy at about 1 billion years after the Big Bang (redshift 6) with properties similar to those of the galaxies in a Hubble Space Telescope study released today (see link below). This includes an efficient rate of turning gas into stars. The simulated galaxy is being fed by streams of cold gas (green and yellow) flowing in along filaments from the cosmic web. This fuels the star formation occurring in the regions with the densest gas in this galaxy (red and white), mostly in the galaxy’s center but also in clumps around it. The gas in this galaxy has shrunk to a compact, star-forming “blue nugget” with a violently unstable, clumpy disk.